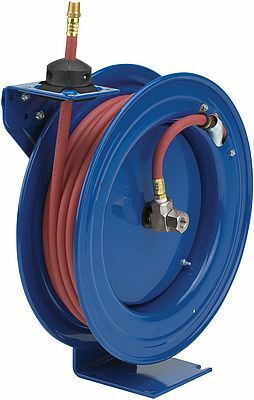 Coxreels' Pure Flow Series of hose reels has been designed specifically for breathing air and clean fluid transfer applications. These models have non-corrosive air and fluid paths with machined from high quality stainless steel full-flow swivel and Nitrile non-toxic food grade seals ensuring clean, non-contaminated, safe and reliable transfer of breathing air, potable water or other clean fluids. These reels provide safe storage of respiratory air hose line for low and high pressure breathing air systems, as well as storage for potable water hose line for drinking water systems, or storage of any hose requiring sanitized and non-contaminated fluid transfer applications. The reels are conveniently offered in spring rewind, hand crank, and motorized retraction options. These reels are used applied in fields of application such as fire rescue, pharmaceutical manufacturing, food and chemical processing plants, hazardous site cleanups, and medical and hospital air services.